Dining - Mexican, vegetarian, american classics -Guerneville has all the most popular dining choices. Featured: Sparks Vegetarian Restaurant 16248 Main Street, (707) 869-8206. Entertainment - Highlights include a sports bar, brew pub, live music and other diversions. Featured: Mc T's Bullpen sports bar. Located right downtown. Mc T's is a perfect for enjoying a regional beer and watching a game. Parks - There are other parks in the area, but none beat Armstrong Redwoods. Both close and beautiful there is great hiking, camping, biking, horseback riding and facilities for picnic barbeques. Main Street - Stop in at the 5 & 10 for some old fashioned candies, buy a Russian River t-shirt at Kings or find a gift at Rose's River Jewlers. Wine Tasting & Tours - Definitely stop by Korbel just 3 minutes outside of Guerneville. Tours are given daily and the complimentary tasting room offers all the wines you will have just learned about. And if it is lunch time the deli right next to the tasting room serves food that is also popular with the locals. 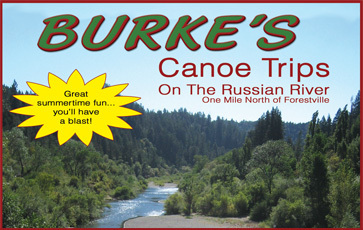 Events - Guerneville hosts the majority of the Russian River's events. The blues and jazz festivals are two of the biggest. View our events resources page to find out what is happening on your trip. Must do Checklist - Our items include wine tasting, a canoe trip, visiting Armstrong Redwoods and others. View the must do checklist page for details. Scenic Drives (website) - A couple of popular drives include: Take Highway 116 from Guerneville to the Sonoma Coast. Take River Road east to Westside Road and continue to Healdsburg.